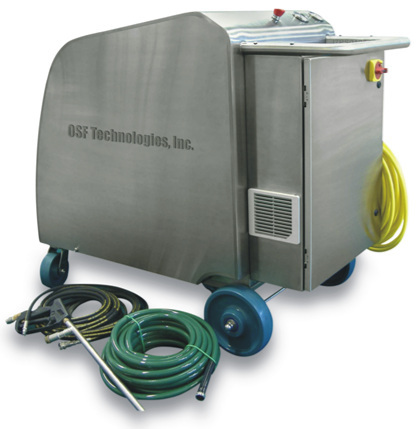 MOBILE SANITIZERS - OZONE SAFE FOOD TECHNOLOGIES, INC. The 42,000 square facility contains several processing lines operating approximately 300 days per year, 24 hours per day. The return on investment for the facility was calculated based on reduction of chemical costs and waste water disposal fees (based on a daily water usage reduction). Through the use of the mobile ozone surface sanitation system, the food process so was able to achieve an annual savings of $18,960. The incorporation of the ozone system for the company’s sanitation process also allowed for one additional hour of production per 24 hours of operation, equating to 7200 additional production hours per year for the processor. Our MMS-3 Mobile Sanitizer is the perfect solution for mobile cleaning, disinfecting, and sanitizing applications. Since it is able to move throughout your processing plant, you can use the Mobile Sanitizer to move freely around your processing equipment and access hard to reach areas. The MMS-3 Mobile Sanitizer delivers a stream of water up to 60 psi that sanitizes surface areas on contact. Because ozone requires no storage or special handling or mixing considerations, it is advantageous over other chemical sanitizers used in the food and beverage industries for sanitation purposes. Our Sani-Jet is a high pressure mobile unit that provides cleaning and disinfection in one step. The Sani-Jet Mobile Sanitizer delivers a stream of water up to 1500 psi that sanitizes surface areas on contact.